HAUBSTADT, Ind. - May 14, 2016 - David Gravel utilized his speed, and a touch of luck, Saturday night as he clawed his way around pole-sitter Kerry Madsen on the opening lap of the feature, then held off another non-Outlaw, Brady Bacon, in the closing laps to score his second World of Outlaws Craftsman® Sprint Car Series victory of the season at Tri-State Speedway in Haubstadt, Ind. Gravel controlled the top spot for all 40-laps, but his victory did not come easily, as he had to battle through lapped traffic while also trying to hold off a hard charging Bacon for the win. "The CJB Motorsports car is obviously pretty good here after Paul [McMahan] won the two years previously, so I had to back that up," Gravel said. "Hopefully, this leads to more wins to come and a great season." When the checkered flag fell, three non-Outlaws drivers: Bacon, Parker Price-Miller and Kerry Madsen held top-five finishing positions. Series regulars, Gravel, and seven-time series champion Donny Schatz, held the other two spots. "This place - I guess my adrenaline pumps extra hard when we are here - I was just trying to get to the front," Bacon, a non-Outlaws driver who finished second said. "I am disappointed we didn't get there, but I'm just thrilled to have another good run. It's been a good year in the winged car and a good year in everything so far, so hopefully I can keep it up and maybe we can steal one somewhere else." Gravel, in the Big Game Treestands/JRC No. 5, showed speed early in the night as he recorded the overall quick-time during qualifying. Unfortunately for Gravel, his speed did not translate to his heat race as Price-Miller, a native of nearby Kokomo, Ind., was able to defeat Gravel for the heat win. Price-Miller's heat win provided an insight into things to come for the non-Outlaw drivers, as former Outlaw driver Madsen also defeated series regulars in his heat race to join Price-Miller and Bacon in six-car dash field. The dash field was split evenly with the three non-Outlaw drivers versus the three Outlaw drivers of Gravel, Schatz and Brad Sweet, for a six-lap showdown to determine the starting six positions in the feature. Gravel's luck started with the dash invert draw, as the top four were inverted, catapulting him to the pole-position. Gravel could not capitalize on the lucky draw however, as Madsen, who started on the outside of Gravel, was able to capture the victory in the dash, which placed him on the pole for the feature. When the green-flag dropped for the feature, Gravel, from the second starting position, powered around Madsen's outside on the opening lap to claim the lead. Gravel maintained a steady lead early over Madsen and Price-Miller in the Flying AG/360 Yield Center No. 2x, who had started fourth and made his way around third-place starter Schatz. For the second night in-a-row, the leader was never able to escape his pursuers and build a large lead on the field. Instead, Gravel fought his way through lapped traffic at the tight, quarter-mile track all night, allowing Madsen and Price-Miller to stay glued to his bumper. As the laps ticked off, Bacon, in the Fatheads Eyewear/Telstar No. 99, managed to charge his way from the fifth starting position to the second spot, as he made his way around both Madsen and Price-Miller near the halfway point in the race. Bacon reeled in the leader and applied pressure, as he tried to force Gravel to change his line while the two battled through slower lapped traffic. "[Gravel] just caught a couple of breaks late in the race in traffic when a couple of guys pinched me up into the wall, and I lost just enough ground," Bacon said. I think in open track I could catch right back up to him but the leader sometimes has an advantage when second place shows him their nose, they kind of hesitate a little bit. With just 10 laps to go, Gravel jumped to the bottom of the race track to stall Bacon's momentum. "I saw Brady [Bacon] on the bottom, so I had to move down and protect it," Gravel said. "I thought in lapped traffic we were pretty good but it was hard to pass lapped cars, so I was just happy that I could move down and hold him off." When the checkered flag fell, it was World of Outlaws driver David Gravel that led all 40 laps of the feature to claim the highly contested $10,000 to-win prize at Tri-State Speedway. "I thought it was big when I cleared two guys on the bottom when Brady was running the bottom, and I know that gave me a little bit of time," Gravel said. "I was just trying to move around and make them guess where I was going, because running first you don't always know what is going on behind you and it's a disadvantage." Bacon, for the second year in-a-row, finished in the runner-up position to a CJB Motorsports car at Tri-State after finishing behind Paul McMahan in 2015. "We had a really good car, and we have had a really good car all year," Bacon said. "This is my best chance every year to get a chance to win, and we were really close. It is easier to swallow after last year leading most of the race - tonight we were charging, but just couldn't get there." Price-Miller held on for a third place finish, which is his best World of Outlaws finish. "Haubstadt is probably one of my favorite tracks in a winged car," Price-Miller said. "We had a fast car...I think we had a car that could've won, but I just made too many mistakes and lapped traffic was really hectic. I got a little tight in the dirty air, but I'll take it, it was a good run. "The World of Outlaws are the greatest out there and the toughest in the business...if you can run with them and finish on the podium, it's a good night." The World of Outlaws Craftsman® Sprint Car Series will cross into Pennsylvania for the first time in 2016 for a midweek showdown at Lincoln Speedway in Abbottstown, Pa. for the Gettysburg Clash on Wednesday, May 18. For more race information and ticket purchasing options, visit: www.LincolnSpeedway.com. 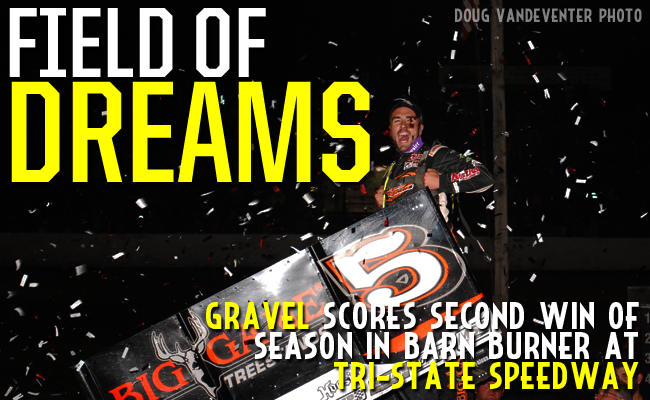 RACE NOTES: David Gravel picked up his first quick-time, and second victory of the year...Paul McMahan ended his two-year winning streak at Tri-State Speedway, finishing in the 14th position...Brad Sweet and Donny Schatz have now both eclipsed the $100,000 winnings mark for the 2016 season. CONTINGENCY WINNERS - MSD Ignitions ($25 cash): Jacob Allen; MSD Ignitions ($50 cash): David Gravel; Penske Shocks ($50 cash): Donny Schatz; JE Pistons ($50 cash): Kerry Madsen; VP Racing Fuels ($50 cash): Brad Sweet; Edelbrock ($50 cash): Terry McCarl; Comp Cams ($50 cash): Shane Stewart; Morton Buildings ($50 cash): Greg Wilson; Cometic Gasket ($50 cash): Critter Malone; Super Flow ($50 cash): Paul McMahan; Craftsman/Sears ($100 cash): Kerry Madsen;KSE Racing Products ($100 product certificate): Jamie Veal; Comp Cams ($50 product certificate): David Gravel; JE Pistons (Set of Rings): Daryn Pittman; JE Pistons (Set of Rings): Cody Kinser. SEASON WINNERS: Brad Sweet - 6 (Volusia Speedway Park on Feb. 13, Volusia Speedway Park on Feb. 14, Cotton Bowl Speedway on Feb. 26, Ocean Speedway on April 1, Bakersfield Speedway on April 15, Plymouth Speedway on May 13); Donny Schatz - 5 (Volusia Speedway Park on Feb. 14, The Dirt Track at Las Vegas on March 4, Stockton Dirt Track on March 18, Stockton Dirt Track on March 19, Silver Dollar Speedway on April 2); Daryn Pittman - 3 (Royal Purple Raceway on Feb. 27, Perris Auto Speedway on April 16, USA Raceway on April 18); David Gravel - 2 (Thunderbowl Raceway on March 12, Tri-State Speedway on May 14); Joey Saldana - 2 (The Dirt Track at Las Vegas on March 3, Devil's Bowl Speedway on April 22); Shane Stewart - 2 (Arizona Speedway on March 6, Devil's Bowl Speedway on April 23); Jason Johnson - 1 (Placerville Speedway on March 24); Jason Sides - 1 (I-30 Speedway on April 26). World of Outlaws Craftsman® Sprint Car Series Statistical Report; Tri-State Speedway; Haubstadt, Ind. ; May 14, 2016. Last Chance Showdown - (12 Laps - Top 6 finishers transfer to the A-feature) - 1. 1S-Logan Schuchart [-]; 2. 71-Jamie Veal [-]; 3. 4K-Kody Kinser [-]; 4. 19-Paige Polyak [-]; 5. 71M-Paul May [-]; 6. 1A-Jacob Allen [-]; 7. 1M-Jim Moughan [$200]; 8. 9X-Paul Nienhiser [$200]; 9. 6-Bill Rose [$200]; 10. 85-Mike Terry Jr [$200]; 11. 79J-Jacob Patton [$200]; 12. 3-Dakota Jackson [$200].